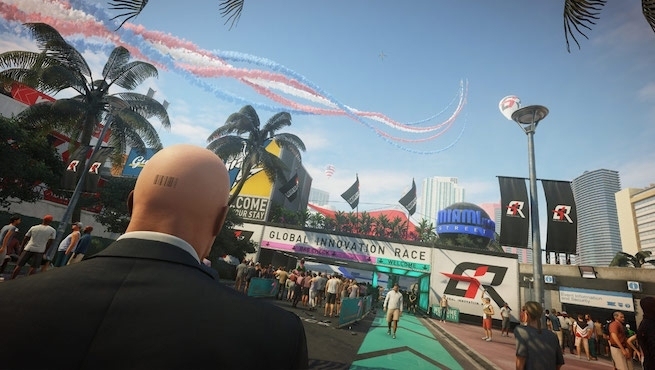 IO Interactive has released a new gameplay trailer for Hitman 2. This time, we get a closer look at the Colombian setting. The trailer is brief, but shows how Agent 47 navigates a jungle environment while in pursuit of cartel leaders. The trailer opens with 47’s handler welcoming him to Colombia. His task is to dismantle a drug cartel in one of the South American country’s villages, Santa Fortuna. Of course, dismantling such a trade means assassinating its leaders. Apparently, the presence of all three bosses in Santa Fortuna is a rarity. Thus, Agent 47 must seize this opportunity and make the most of it. Colombia’s jungle environment offers a boon to 47’s stealth tactics. This is evident throughout much of the trailer, when he’s seen dispatching security guards in tall vegetation. However, for those not keen on using stealth, causing a ruckus seems a viable option as well. Hitman 2 will launch with six locations. So far, IO Interactive has only confirmed Miami and Colombia. Yet, a leak has suggested the other four locations include New Zealand, Mumbai, another USA locale, and the North Atlantic. While IO hasn’t corroborated these claims, they don’t seem too far beyond the realm of possibility. Hitman 2 launches on the PlayStation 4, PC, and Xbox One on November 13, 2018. For those who purchased the 2016 Hitman release, an updated version of its content will be available for free on launch day. Folks who didn’t pick up the episodic title, but want to join the fun, can do so with the Hitman Legacy DLC Pack. IO Interactive has not yet announced pricing for the Legacy Pack.